I've been excited about Hunted: The Demon's Forge ever since I first saw the game on this very website last year. 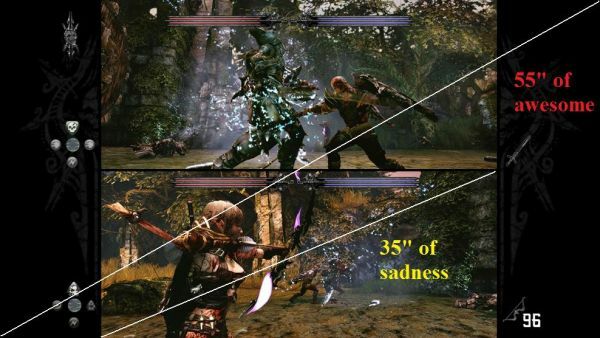 When I found out about the split screen co-op, I was thrilled. Imagine my surprise when I got a review copy of the game the same day as the retail release. Uh-oh. There's only one real reason to avoid an early screening for a game. I bet you can figure it out. The delay may have been due to the holiday, but I suddenly had a bad feeling about this. I popped the disc into my 360 and was immediately underwhelmed by the graphics. The character models of Caddoc and E'lara looked dated and lacked polish. They weren't ugly, but something was off. And I'm not talking about the fact that these "fantasy" characters both looked as if they had just walked out of a Hot Topic. My couch co-op partner noticed it, too. So sad. So very, very, sad. Apparently, the game developers over at InXile have something against using all of that wonderful, expensive screen. This isn't the first game to have a problem like this, so I won't dwell on it for too long. I just want you to know that I couldn't find a way to change it. I even went into the display menu for the Xbox 360 itself and tried to change the aspect ratio, thereby cheating the system into a vertical split, like you can in Borderlands. It was a no-go. Even if you're rocking a 55 inch display, you'll have to sit pretty close to the screen if you want to see what's going on. And if you're playing as E'Lara, you'll want to see what you're shooting at. I should note here that if you play split screen, both of the characters belong to the first player. All of their stats and gear are saved to that player's game. "But I don't care about split screen;all my friends are digital. I just want to know about the game play!" I hear you, friendly online gamer. 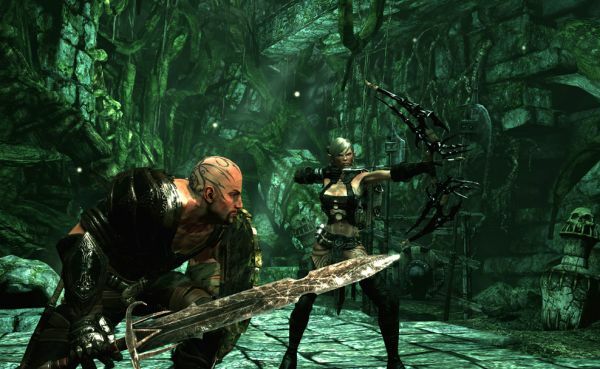 Hunted has been called "Spears of War," drawing comparisons to the Gears of War franchise for its third-person perspective, co-op mode, cover system, roadie run, and executions of downed opponents. Sorry, folks, this game doesn't have that kind of polish. The co-op is entirely competent, sure, but the actual game mechanics fall short in many areas. The cover system leaves a lot to be desired, running is an un-steerable mess, and execution animations are repetitive and bring the flow of battle to a jarring halt. The story is weak, bordering on non-existent, espcially early on. Caddoc and E'lara's main motivation seems to be money. But in the end, isn't everybody's?